God's heart is for the underdog. He protects the widow and the orphan and has chosen the poor of this world to inherit His kingdom. 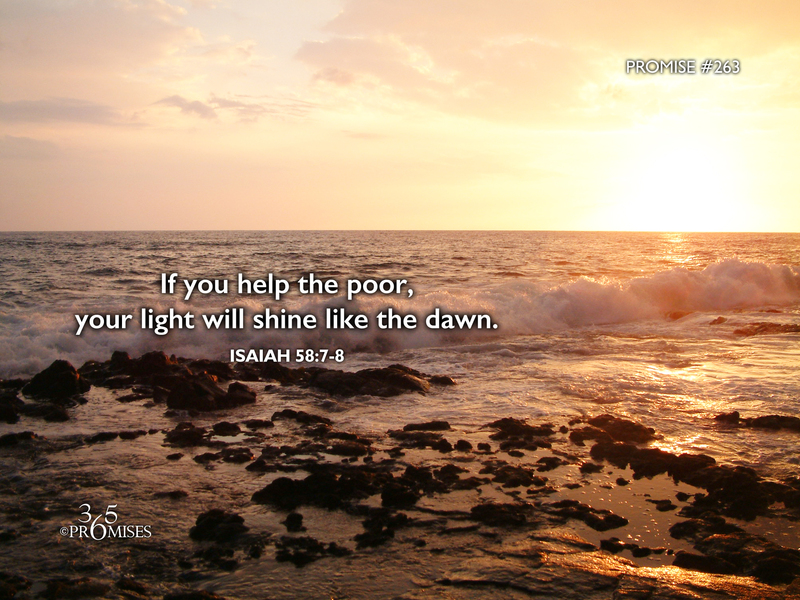 In today's Scripture promise, God tells us that if we feed the hungry, give the poor shelter and clothe the naked, then His favor and His blessings will shine on all that we do. The NLT version of Isaiah 58:8 says... “Then your salvation will come like the dawn, and your wounds will quickly heal. Your godliness will lead you forward, and the glory of the Lord will protect you from behind." What a glorious promise! If we look after those who can't look after themselves, then God will look after us in every way possible. Our wounds will quickly heal, the light of our godliness will lead us forward and the glory of the Lord will protect our backs! God's heart is for the underdog. In every way, we too are underdogs that God protects and provides for. May we see the world through our Father's eyes today and see the many opportunities that He presents to us so that we can be a blessing to others. Lord help us today to see the needs around us and be a manifestation of your love, life and provision to those who are in need. Thank you that as we help others, your love and your glory will keep us safe too.